Thank you Dina!! What a sweet comment! It’s great to see you on Instagram, too Sorry that your current ms is making you miserable, but yes — I agree — misery before happiness in many writerly pursuits (btw had this post been about writing, then I might have said that today, I join you in writerly misery…you’ve got your good days, you’ve got your bad days, haha, right?). This post made me happy. May your spring be filled with ever more happy moments. Glad my post made you happy, Lisa!! Here’s hoping for many more happy moments for both of us! Music for me, too! I’m making it a priority lately, so I try to remember every time we’re just hanging out in the house to put some on. I’ve been thinking about becoming more active on Instagram — I think I have an account but haven’t used it. My husband and I are taking a road trip out west in about a week, and that just BEGS for photo documentation, right? Happy to meet another music person — so instrumental (sorry, couldn’t resist). I hope you will get onto Instagram. It’s really amazing to be centered around a visual art instead of words (although there are plenty of those too) and just selfishly for me, I’d love to see more photos of the west! Definitely begs for photo documentation, no question! 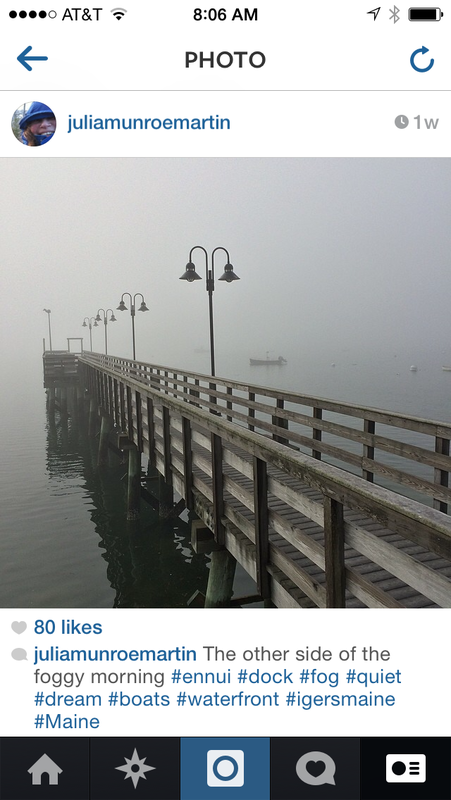 I love that picture of the pier, Julia. It’s beautiful! Wish I was walking out on it. Wish you were here to walk out on it, Cynthia! It’s another gray day and I’m heading out to take more pics. It’s addictive especially with feedback from friends 🙂 Have a great spring! Thanks so much for the shout-out, Julia. I’m happy that my post inspired this one. I love hearing about the little things that inspire people. I’ve been wanting to get more involved in Instagram. I’m so mired in words all day, it’s nice to express myself in pictures once in a while. And it’s a good way to get inspired with photos. Ditto the comments on your photo, Julia! Gives me goose bumps–evocative, intriguing, begs the question, “a story waiting to be told?” Not necessarily in your having snapped the shot, but simply in the mood it stirs within. 🙂 Spring, good music, and ‘focusing on the positive’. A great message for any moment! Thanks for the inspiration. 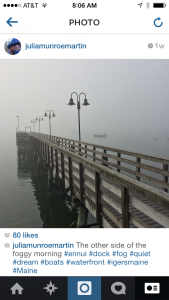 So glad you liked the photo, Micky! Thanks for your kind words! You’re welcome for the inspiration. I’m on a roll with the positive and I’m riding the crest 🙂 Let the positive times roll! Julia, a lovely post. I hung our hummingbird feeders the other day because I heard thee trill of their beating wings. To me, that sound and their presence is the most optimistic sign that summer is impending, despite the gloom trying to convince me otherwise. I woke up this morning and the poor birds hovered around the frozen sugar water, desperately trying to get a drink. Sigh. As for the music, I too have a collection of happy, upbeat songs to jog to. They’re not always tunes I would just sit down and listen to, but they keep my feet moving and my soul humming! Julia – I thoroughly enjoyed reading your delightful happiness list! Two weeks ago we moved cross country from Crystal Lake, Illinois to Boise, Idaho. We’re happier than pigs in slop (so to speak)! Oh, how I miss those osprey! Great post, Julia. Glad to read all your happy news. Love your photos. Glad to learn you are a writer. Runs in my family. Just had my 60th birthday and danced to the “Happy song”. Love it. My son ,the film school graduate, is now living on Zapata Ranch, CO doing film work for them. Check out the great online magazine “Ranchlands Review”. He is Isaac Cole. Think you will enjoy it. Look forward to reading your works. Hi Gloria — so nice to meet you and see you on my blog! Nice to meet another Happy song dancer, too 🙂 I actually already follow your son on Instagram (and Ranchlands and everyone else I can there…what an amazing place! Incredible pics!). His photos are something else! I love the magazine too. Amazing. I am so appreciative that you found me from Instagram; nice to make a new friend! Thanks again for the read and for the comment. Are you a writer as well? I love that song, too. It always makes me want to dance. I will have to check out Instagram… I’m so behind! Boy howdy, do I feel you on this one. Spring has been soul food for me lately! The birds have been amazing so far and I’m enjoying my morning wake-up call to quite the symphony of sounds. I put my hummingbird feeder up last Sunday and within an hour I had a visitor. That made me quite happy. Music has made me extremely happy as well. The Secret Life of Walter Mitty has some great songs and I’m addicted to Lord Huron, Jose Gonzalez, and Rogue Valley! Check them out–total chill yet inspiring. I had to laugh at you not knowing the carpet color… boy have I been there! Yay for new carpet! I haven’t seen Walter Mitty but really want to (one of my grandmother’s favorite books) and will definitely check out the songs. As for Instagram accounts, I think you were the one who told me most of my faves. The horses. Colorado and Montana. Oh, and there’s one with amazingly cute puppies right now (and horses TOO!) and of course they’re in Montana: @openrangeranch1114. Glad you like the UP! I’m enjoying my fitbit. I for sure find myself walking places I wouldn’t normally or parking further away. I can easily get swept up in numbers. But hey–if that’s what it takes it works for me. I get swept up in the numbers too — and stressed out about not meeting goals. I honestly do think it’s miscalculating because I can’t get any writing done I’m walking around so much! I read that Fitbit is more accurate so you made the right choice. MEH has offered to take the UP so I could get a Fitbit… we’ll see. As you say, whatever it takes to work. I concur with your ‘happy’ reasons. I lived in NE for 10 years before returning here to the SF bay, and when our first crocus sprang out between the snow piles, I’d do a happy dance for an hour. Spring is more subtle here, but also beautiful in its own way. Writing a blog and meeting other ‘like’ bloggers makes me happy, and I’m glad I found yours. Hi Pamela, so glad you found my blog! I agree too that finding other bloggers is another thing that makes me happy. As for the bay area, I used to live there so I know exactly what you mean — more subtle but also beautiful. And you have the advantage of the mild climate yearround, so wonderful. Thanks for the visit and for your comment!